Buick has updated its Facebook page, bringing its Moment of Truth web marketing campaign to the popular social networking site. This means that Facebook users can now experience Moment of Truth without leaving Facebook. To see Moment of Truth in action, visit facebook.com/buick and click on the Moment of Truth tab (which currently seems to be cut off at Moment of T). The new tab carries over the Moment of Truth website to the Facebook page, inviting “consumers to experience the 2011 Buick Regal through an interactive online experience” and serving as a non-traditional online aggregator that pulls in content from a variety of online sources. Moment of Truth pulls in YouTube videos (tagged with MOT Regal), Flickr photos, Twitter tweets, comments left on Buick’s Regal tab on Facebook, as well as automotive reviews and consumer blogs. Anyone can contribute to Moment of Truth by sharing their stories related to the Buick Regal and posting them on the web. The Moment of Truth section joins other tabs on the Buick Facebook page, including All New Regal, Showroom, and Welcome, as well as the default Facebook page tabs (Wall, Info, Events, Photos, Discussions, Welcome, and YouTube). 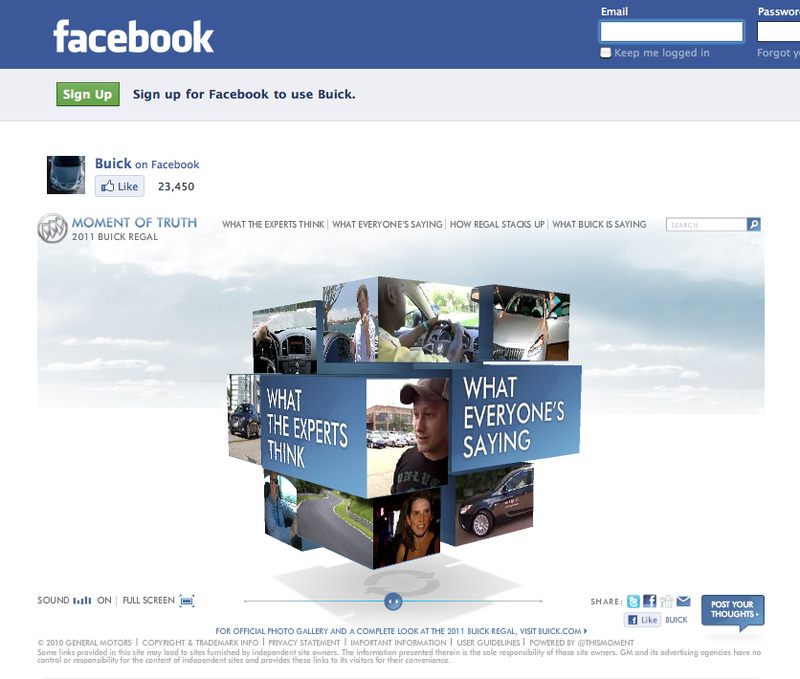 Good on Buick for making Moment of Truth available inside of Facebook. We’ve applauded the Moment of Truth campaign before, and its availability to Facebook users – inside of Facebook – is one way that will enable more people to come into contact with the effort. More than anything, this will truly please the users who prefer to browser the web without leaving Facebook. If Buick keeps this up, it may be well on the way of unseating Lexus from the throne of the pure luxury vehicle kingdom.